The articles in the collection are drawn from a number of sources, including Planet Waves and our various annual editions, as well as blog entries, my notebooks and one from an earlier book called 313. The book begins with a new piece that covers the history of the Harmonic Convergence and its possible influence on world events. I then present a retrospective of writing describing events that fit the pattern, either historic or philosophical, of how we approach the topic of irrevocable change. Even if you’ve read some of this writing before, the pieces will now come together when you see the ideas in context. I have consistently treated the concept of 2012 as something we are creating now, even as time accelerates and we race toward the future. Different articles offer perspectives on the Mayan day count as well as the Western astrology associated with 2012. I am not making predictions; rather, my intent for all of these articles has been to focus our minds on the present moment and enter the future through immediate awareness. I am describing the process of opening up to the moment. The book is beautifully illustrated with Mayan-inspired glyphs created by Carol McCloud. These are like no artwork you’ve ever seen before. 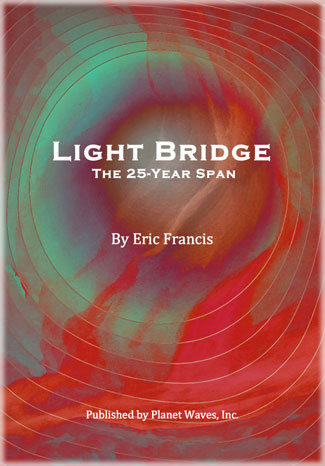 Light Bridge: The 25-Year Span comes with a separate file of historic charts. We have done our best to leave links to other sources embedded in the text. Arguelles was the author of The Mayan Factor: Path Beyond Technology, which became a kind of platform for creating the Harmonic Convergence. He was also author of Dreamspell: The Journey of Timeship Earth 2013 which was a book and a game that came out in 1990. Dreamspell is an interpretation of Mayan daykeeping that teaches one to use the Mayan calendar in a practical, accessible way. Arguelles was the father of the current movement to adapt Meso-American calendar systems and other alternative models for considering time. In a sense, what we think of as time is really a prison that locks us into a time/money orientation of consciousness. I was never Jose’s student, but his ideas have touched my life and informed my astrology through different teachers, friends and colleagues. We think it’s an intriguing synchronicity to be making this work available when so much attention is being given to Jose’s ideas. Here is ordering information. Delivery is instant. The format is a downloadable PDF with images solid enough that they will print nicely. Thank you for your interest. I think you’ll love this project. It’s been a lot of fun to create.